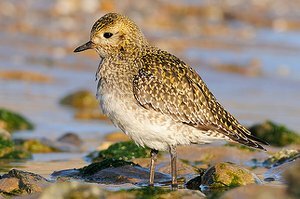 The Golden Plover in winter has a white underside, pale yellow breast, buff-yellow spotted back and a pale stripe above the eye. 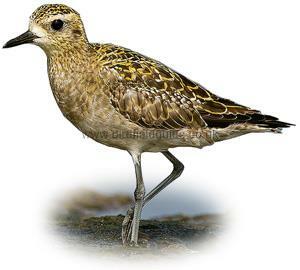 A beautiful bird in summer the Golden Plover is similar to the Grey Plover, however as the names suggest the Grey Plover has a grey back and the Golden has a yellow spotted back. 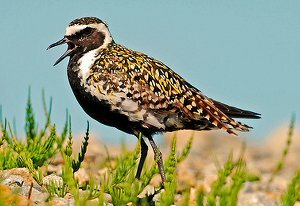 The Grey Plover breeds in the extreme North of the hemisphere so birds seen on moorland in Europe during the summer are likely to be Golden Plover. During the winter in coastal locations the 2 species often flock together or feed in the same areas. Note the white underside and yellow spotted back and wings, the eye stripe on this bird is not very defined. Note the eye stripes which are clearly visible in this image. 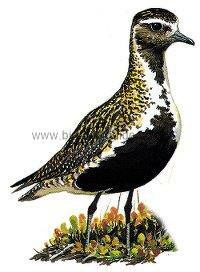 The Golden Plover in summer has a jet black underside and a rich yellow and black back. Various sub species have different amounts of black on the underside. 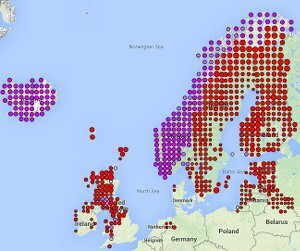 Breeds in the very North of Europe mostly seen as a passage migrant in the rest of Europe. In the UK it breeds in the North of Scotland and locally in parts of England with Dartmoor in Devon being it's Southern limit. Breeds on moorland, usually above 500m and free from human disturbance. 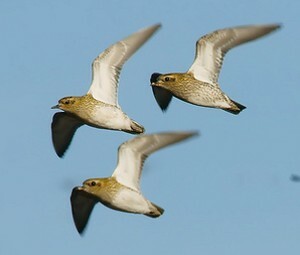 In winter the Golden plover can form huge flocks on estuaries and farmland, usually near the coast.